Black hornets, also called bald-faced hornets, belong to the Vespidae family, which includes yellow jackets, wasps and hornets. Black hornets (Dolichovespula maculate) are more closely related to wasps and yellow jackets than to true hornets. 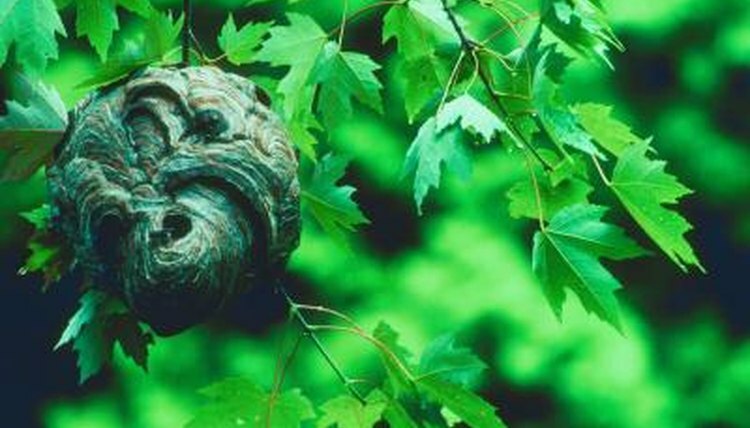 Bald-faced hornet colonies are found throughout the United States and southern Canada. Black hornet workers and drones live for only a few months, but queens can live for up to a year. In spring, each bald-faced hornet queen constructs a new nest. She chews wood and mixes the pulp with her saliva. She constructs a small nest containing tiers of cells, covered with gray paper and having a single entrance hole. The nest will be expanded by workers as the colony grows, possibly reaching 3 feet tall. Black hornets spend their egg, larval and pupal stages inside the hive, emerging as adults. New queens breed in the fall, before taking refuge under tree bark or inside a building for protection from winter's harshness. In spring, after beginning a new nest, the queen lays her first eggs in the nest's empty cells. The young will mature into asexual female workers. The queen feeds chewed insects to her first young, caring for them until they reach adulthood. Laying eggs is the queen's only future responsibility. Female workers are produced all summer. They enlarge the hive and gather food, feeding the young and the queen. Black hornets' dine on nectar, pollen, bees, caterpillars, aphids and other soft-bodied insects. By mid-summer the new colony has up to 400 workers. Female workers also act as the hive's guardians, fiercely defending the queen and the hive. Black hornets seldom sting humans, but will attack anyone who wanders within a few feet of the hive. Male black hornets, called drones, are hatched from unfertilized eggs. In autumn, the queen produces drones and future queens. Drones have no stingers, and play no part in protecting the hive. Impregnating future queens is the only role drones have in their society. Shortly after breeding, the drones die from old age or exposure to cold temperatures, and the future queens seek refuge from the winter's weather.